Human blood, the Bible, and thousands of genuine American bank notes are elements of The Tenth Plague. The happening was launched at Easter 2001 in Denmark, to denounce the greed of the pharmaceutical industry. They were filing a lawsuit about patent rights in South Africa and so cynically defending their right to decide over people’s lives. Ten big canvasses are spanned up on rough, bulky frames shaped as doors. The frames are covered with gold foil. 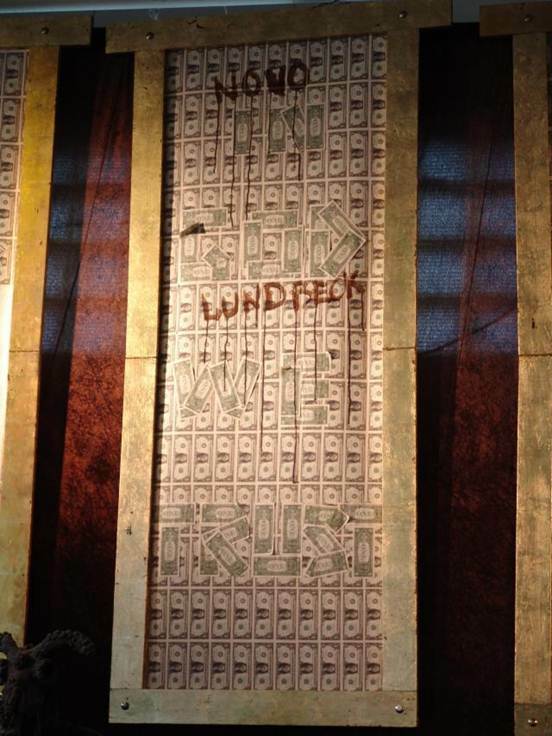 The canvasses are coated with 2500 genuine dollar bills ordered from the Central Bank in New York. Some of the bills will shape the text In God We Trust. On the dollar notes the names of the greedy companies are painted with human blood. The happening was intended to have international scale. But as the pharmaceutical companies opted to give up the lawsuit the project was temporarily suspended. But expressions of support had already arrived, e.g. from several bishops in Brazil. Jens Galschiot has no doubt that some day the pharmaceuti­cal companies will make a new attempt to defend their hegemony and so there will be an occasion to reopen the case. HERE you find the biblical narrative from which the project takes inspiration.